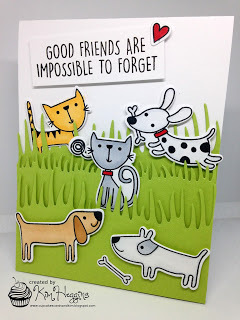 Time for Muse Challenge 254 where Kim has provided a playful card for our inspirations. My rendition includes general theme, animal friends, grass, upper left-placed sentiment. Oh my, those guys are adorable! I don't think I've seen them before, but they are awesome! Thanks so much for joining us at Muse this week, Marilyn! Adorable set of friends, Marilyn! Bright & fresh! Oh, this made me smile. Super cute and fun. ADORABLE!!!!! just too darn cute, so in love with your wonderful card. Thank you so much for playing along with us at Muse!